Heat the broiler to high. 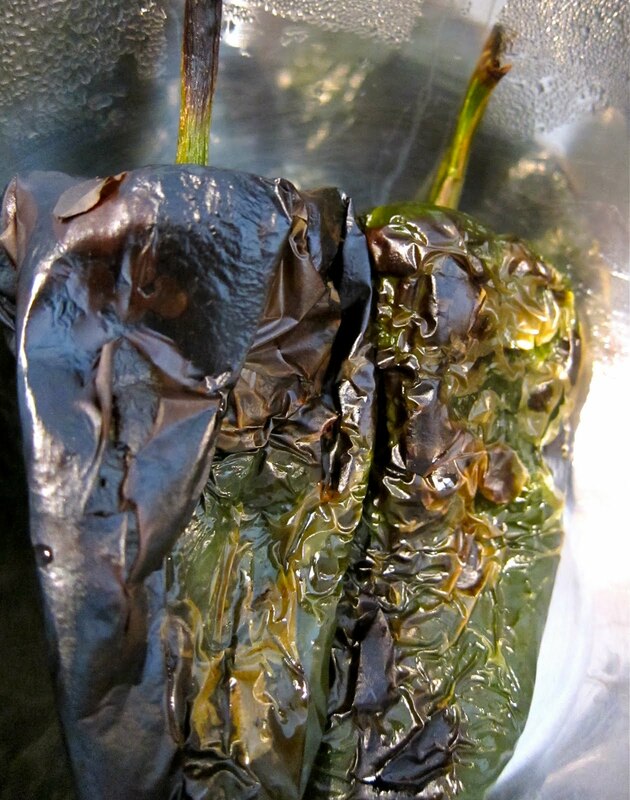 Arrange the poblanos on a sheet pan, put them under the hot broiler and char until blackened an all sides, 10 to 12 minutes. Leave the door of the oven cracked to allow the steam to escape. Peppers can also be easily charred over and open stovetop flame if you have gas burners. Put the peppers in a bowl and cover tightly with plastic wrap. Allow the peppers to sit until cool enough to handle. Peel and seed the peppers. Heat the extra-virgin olive oil, 2 turns of the pan, in a skillet over medium-high heat. Add the jalapeno, onions, and garlic and cook until the onions soften, about 5 minutes. Put the tomatillos and a small handful of cilantro in a food processor. Coarsely chop the poblanos and add them to the processor. Process until almost a smooth sauce forms, about 1 minute. Pour the sauce into the skillet and stir to combine. Stir in the cumin, honey and stock, and season with salt and pepper, to taste. Reduce the heat and simmer about 20 minutes, then add the lime juice and turn off the heat. Pour a thin layer of sauce into the bottom of a medium casserole and place 4 corn tortillas on top.Note: In the picture you see I used 6 tortillas. I did this because that is how many I use for my traditional enchilada casserole recipe, but I would advice not to do this. They absorb a lot of the sauce. Top with some shredded chicken, dot with some sauce and small spoonfuls of Mexican crema, creme fraiche or sour cream and sprinkle cheese. Repeat twice more. Preheat the oven to 375 degrees F. Put the casserole on a baking sheet and bake until heated through and bubbly on top, about 40 to 50 minutes. 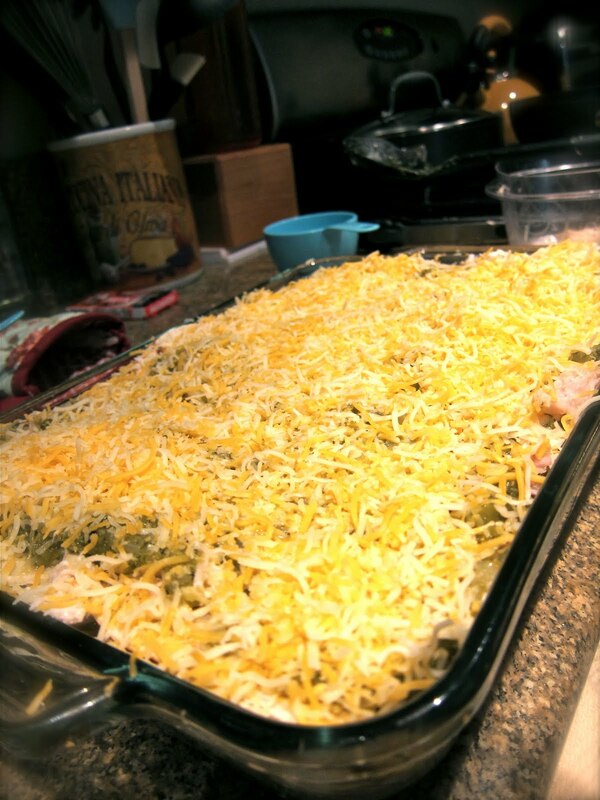 The baking sheet will catch any drips of sauce or cheese. I know it looks messy, but it was great! I couldn't believe I used all of that sauce, but I found myself wanting more when chowing down. Like I mentioned above, it may be because I used more tortillas than the recipe called for. If I made this again, that would be the only change I would make. Rachael Ray, you've done it again.